But not when it comes to beans! Beans are frugal, nourishing, and digestible — because they can be easily soaked before canning. This means you don't have to sacrifice nutrition on those need-to-get-dinner-on-the-table-now nights. I also buy beans in bulk, meaning I save money in the long run! Ready to get canning? Let's go! You need a pressure canner to can beans. Water bath canning is not an approved method for canning beans. Fill each pint or quart jar 1/3 of the way full with soaked legumes. If desired, add 1/2 teaspoon sea salt per pint OR 1 teaspoon sea salt per quart. Simmer a small saucepan of water. Remove from heat. Add canning lids. Cover pot to keep the lids hot. Bring a kettle of water to a boil. Then fill the waiting jars with this boiling water to within 1-inch of the top. Clean rim, top each jar with a hot lid, then add band and screw closed. Put jars into the pressure canner. Following the manufacturer's directions, bring the pot up to 10 pounds (15 pounds if you live above 1,000 feet) pressure. Process pints for 75 minutes OR quarts for 90 minutes. Let canner's pressure reduce. Transfer jars from canner to a clean counter lined with a towel. Let jars cool completely, then check all lids for a proper seal. Store. Do you can dry beans? Do you have any tips to share? Are you canning them in the soaking liquid- or adding new liquid? Seems like canning them in the same liquid they were soaked in would not be beneficial- from a health standpoint. No, you drain that water off and put fresh water on when ready to can them. Nicole, Linda is correct. After soaking you drain, then fill the jars and add boiling water before you seal with a lid and band. I can all the beans we eat (a lot!). A couple things to add… a Honduran friend told me to put a clove of garlic in with and remove it when you open the jar. It helps remove the gas causing whatever-it-is ????. We love the added flavor as well. Also, I like to let the beans actually push a tiny sprout before canning them. Otherwise, I do the same things you do! Lovely money saver, eh? Oh Zedda! That’s sounds delicious. I will have to add a clove of garlic next time I can beans. It is a huge money saver for us. How do you get the beans to sprout? What do you mean by letting the beans push a tiny sprout? What does, “letting the bean push a sprout” mean ? Thanks, Zedda. I was wondering if sprouted beans would can as well. All I have is black eye peas and lentils would I be able to can them? Since they are smaller than other beans would the canning time be less? Thank you! canning time would remain the same to ensure safety and a good seal . Judy is correct. The canning time would remain the same, although you might find that lentils and black eyed peas turn out a bit mushy. Sometimes they come out fine and other times they are a bit soft. This is great to know! I have been wanting to can our own beans for some time. I’m always forgetting to get them out and soak them overnight. Canned is a great time saver, but ~ I didn’t know that I could pre soak. We’ll definitely be doing this with all of our beans. Thanks Katie! You’re so very welcome. I hope you enjoy have a pantry stocked with nourished canned beans. I love to can them with garlic and onions, and sometimes diced ham. They are so much better than store bought! I have never thought to add ham! And what’s even better, meats require the same amount of time to can. You could add chicken or even bacons, mmmmm. I remember reading that any product canned with meat in it needs to be done in a pressure canner to insure all bacteria are killed. Water bath or regular cooking pressure cooker cannot insure that. Just saying. No worries. The above instructions are for pressure canning. I’ve been canning beans for a few years now. It’s SO easy, and makes it so it’s easier for me to use “dried” beans. I knew right off when I started using them, that it was going to be hard for me to always use dried beans, instead of grabbing a can of beans, because I don’t always remember to plan that far ahead. So…I went looking around, trying to figure out how to can my own, since that way I’d know what was in the jar, instead of buying the store bought canned beans like I used to do. At the time there wasn’t a lot of info I could find, but did find enough to finally get it figured out. Since then, I haven’t bought any canned beans, and just made sure I had some of my own home canned on hand, for whenever I decided I wanted to make something with beans in it. One thing I would add, I rinse my beans before canning them, after they have soaked. I soak mine in the jars I’m going to can them in…then dump the soaking water, and do three rinses of the beans, (filling the jar three times and dumping it three times) before filling the jar with fresh water for canning. Oh canner of beans I need help! I followed the directions above- almost to a T- I even added the garlic clove. I did mess up and fill my jars with beans 3/4 of the way and not 1/3- woops! I was using quart jars. I processe them for the 90 minutes when the weight started rockin…. And I took them out when done, and all the beans are exploded and mush! The cannon part seemed successful- but very over cooked which j was trying to avoid. What did i do wrong (other than over filling)? Was 90minutes too long? Deb, for spice, we love to add a little cumin. I buy the cumin whole seed by the pound and use a coffee grinder. It is amazing how much fresher the spice is and what a tiny bit added to beans will do! Oh Len, we love cumin. What a wonderful addition to canned beans. Jayne, I totally understand your fear! I grew up helping my Mom can, and she always STRESSED how you HAVE to keep a CLOSE watch on the canner, and make sure the gage didn’t get to high. It made it so I didn’t really want to start canning on my own when I got married. However, when we finally got in a position when I could (which took a few years) I purchased my own pressure canner from one of the Amish stores close to where my parents live. It happened to be one of those all American canners, that basically has six “screw” type things holding the lid on. I thought THAT would be safer because of that and boy was I thrilled I got that canner, even though they are more expensive. The FIRST time I used it, we discovered the gage didn’t work, but the woman at All American assured me I could still safely use it while a new gage was being shipped to me, just by listening to the sound the weight makes. Since then I’ve canned LOTS in that wonderful canner, and not been afraid at all. I also don’t have to stay right by the canner, watching the gage, and can do other things around as long as I can still hear the rattling of the weight. I just LOVE this canner, and while I’m sure it could still have problems, I’m not to worried about it anymore, because it’s so much safer than what I was used to growing up! As for the aluminum problem…I would love to find one that is stainless steel too…but the cost would probably make it hard to actually be able to get one, and since I ONLY use it to can with…not to cook in, I’m not as worried, because everything is in jars, that I put in it. I DO have a stainless steel pressure cooker however…they are a lot smaller, and food gets cooked right in them, not in a jar, so that is something I would want to for sure be stainless steel. I’m not real good at using it yet…even though I’ve had it for several years, but it doesn’t worry me when I have used it either…it seems to be really safe to use too. Although a stainless steel pressure canner might sound good, remember how much heavier steel is than aluminium. Once the filled jars and water were put in it, I don’t think many average people would be able to lift it. Even with just the water after the jars were removed, it would weigh a ton. This is one of those perfect uses for aluminum. It never touches your food. Even the water the jars stand in can’t get inside the jars. It heats quickly and evenly, is a lighter weight than most metals, and is still very strong and able to hold pressure. Use it with confidence. I’m 65 and the only ones I ever heard of that failed were before the depression time frame. The manufacturing now is far superior. Just keep the vents and seal clean. It will work for years and years. I think fear is normal since it can explode (or so we’ve all heard a horror story or two). I was terrified at first 😉 But we’ve been canning for about 7 years now with no problems. The stories you hear of exploding canners are mainly from back in the 70’s. Modern canners have many safety precautions so that explosions do not happen. As for aluminum, the food isn’t touching the canner. It’s all in jars and the canner just holds the water and pressure. So there is no contamination since it never touches your food and can’t cross over through glass. I’ve never used a pressure cooker, so I won’t pretend to be an expert. But a canner is generally much larger than a cooker and made specifically for canning (it is made to hold jars not food). Cookers are not made for canning, generally are much smaller, and are made to hold food, not glass jars. Hope that helps some. Thank you for these helpful replies!! I guess I am a rule ‘stickler’ and probably legalistic…..so if a canning jar would safely fit inside a ‘pressure cooker’ is it safe to use for pressure canning that one jar? Meaning that size is the only issue as far as their difference? The USDA definition of a pressure canner is that it has to be able to fit 4 quart jars, and have an adjustable pressure weight or gauge. If your cooker is smaller than that, then it is not safe to can in it. The tested recipes include the amount of time to come up to pressure and cool down for a safe product, and a smaller cooker will heat up and cool down much faster, so the food would not receive the proper processing time. The difference is that pressure cookers don’t have gauges to measure pressure or weights, so you can’t be sure it has reached a safe level for long term storage. I have used my pressure cooker many time when I am just canning a few pint jars. When I make salsa, I only make a little. It works fine. One thing to consider with the Salsa though, it can be canned in a water bath because the acidity is high enough. With low acid foods, I would stick with a gauge! Also, if you are using a canner with only a dial gauge, you should have it tested for accuracy each year – your extension office or the manufacturer should be able to do that for you. Pressure canning is for canning food. Pressure cooking is for cooking meals and dishes. Both are accomplished via a pot that’s sealed up tighter than your normal cooking pot — which therefore creates a higher-pressure and higher-heat environment. Another difference, which you hit on. The canners can be aluminum but your food is in jars so that’s not a big deal. The cookers should be stainless steel because your food is going to touch the pot. Also – pressure cookers are usually a lot smaller than pressure canners, simply because of the duties they perform. A pressure cooker cannot be used as a pressure canner, but a pressure canner can be used as a cooker. The two main differences are size (typically canners are considerably larger than cookers, and cookers cannot hold quart jars), and the amount of pressure/accuracy of pressure. Pressure cookers are used for preparing meals which you are going to eat right away. Pressure canners are used to heat foods to an internal temperature where bacteria (especially botulism) will be killed. Since botulism doesn’t thrive when oxygen is present, you don’t need to worry about it when using a pressure cooker to prepare meals to be eaten right away. You do; however, need to be concerned about it when canning as the process of canning removes oxygen (that vacuum seal). For that reason, the amount of pressure needs to be accurate (remember, we test our gauges every year at the extension office!) and the times needs to be followed as tested safe (see http://www.nchfp.uga.edu). Oh, and don’t be scared! Once you start pressure canning you won’t remember life before it! Think of how much faster you’ll get dinner on the table! I have an InstantPot Duo electric pressure cooker and the directions for use say that I can use it for canning. Are you saying that I cannot because it’s a pressure cooker? I bought it because it serves multiple purposes and want to try my hand at canning. It’s designed to do both…have fun. Jayne, if you google stainless steel pots I found several large ones for $50 and less. I purchased the exact size as my wb and another to use for processing foods. Spent less than $100 for both and free ship. A pressure canner has the insert for the jars to sit on, so the don’t cracked from the heat. It can also be used as a pressure cooker, after you remove the insert. A pressure cooker will only cook the food you put in it. It has no raised insert upon which to place your canning jars. I have canned beans a number of times, but always cooked them before canning. I thought this way would sane me that step, so I have it a try. Filling the jars 1/3 only gave me half a jar of beans, and most had broken in the process. JW, How long did you soak the beans and what varieties did you use? Two questions. Can you use an electric pressure canner? How long are the beans good for once canned? Jojo, I’ve never heard of an electric pressure canner. If it is indeed a canner and not a cooker you could use it. The beans are good for 1-2 years once canned. 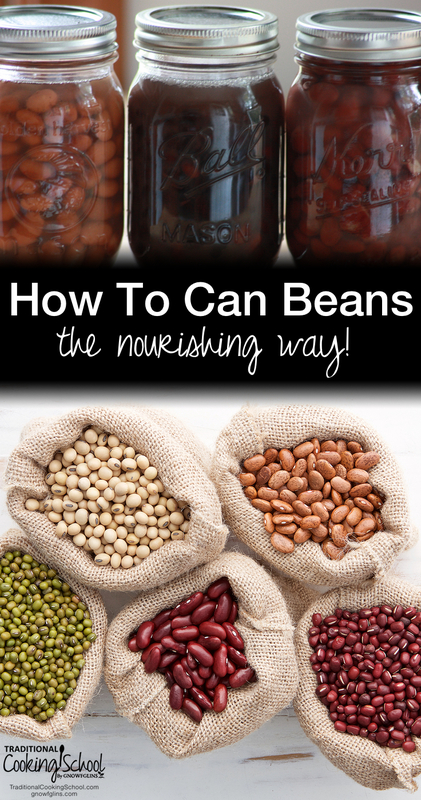 I have never canned anything in a pressure canner, but would like to start, especially with the beans (the thought never crossed my mind to can dry beans — Thank You!). Does it matter that I have a glass/ceramic top stove? Do you have an affordable pressure canner that you could recommend? Have canned on mine for 30+ years with no problems. Last year we invested in a 2 burner camp stove and moved it all outdoors. Our deck is to the north so it was shady and all the mess and odors were outdoors. A couple banquet tables, and an outdoor sink (cold water only, but working on convincing hubby I need hot LOL). So much nicer. Regarding the glass/ceramic top of stove, I heard recently that one lady had trouble getting her canner to heat up properly, and mentioned that the burners were all noticeably smaller than the diameter of her canner. However, my stovetop has an extra-large burner that fits my canner nicely, and it has worked well for me. Just keep an eye on the pressure gauge and time. I’d suggest doing a trial run without food to see how yours works. I have a Presto pressure canner/cooker. Hope this helps. Katheryn, that would all depend on the kind of canner you buy and your stove. See what your manufacture recommends. 1) does your glasstop use ‘variable heat’, meaning does the burner turn off and on in an attempt to not get too hot? You cannot can on a glasstop that does not consistently stay on. 2) Is your heating element no smaller than an inch less in diameter than your canning pot? If it is 2 inches or more smaller, it will not heat consistently and you should not can on it. 3) Does your canner have a flat bottom? Flat bottomed canners can suction to the stovetop and crack it in the moist heat created by condensation. Make sure to use a canner that is concave on the bottom. More and more glasstops are now being made with canners in mind. Check your user manual or ask the salesman. What pressure canner do you use? I’m on the market for one. My advice is to buy the best. The All American is the best. I have one that is over 60 years old and it works fine. The plastic knobs are broken. The plastic handle has been replaced with pipe strap, but there is no gasket to replace. Any canner I know of has a rubber gasket that you will be replacing quite often. They are $10 to $15 each. You can go to Craigslist and fine many Presto or Mirro matic canners for sale, but I never see an All American. I have one All American, and two Mirro matic canners, and if I dont need more than one at a time, you know which one I use. I personally use a Miro, but if I had to buy another one I’d get an All American. I would LOVE an All American!!! Of course All American is #1 choice, if you can afford it. I chose a presto, on Amazon, with free shipping deal it was only $100. I love it. I can hundreds of quarts in it every year with out a hitch and I don’t think I’ll have an any issues for a long time to come either. Mary Ann, I like your thinking. I almost always can beans in the dead of winter when there isn’t much to do and the house is cold. Canned beans have a great consistency every time, and pressure canning is the only way you can cook dry beans that are more than seven years old so they are soft. I add a little vinegar to the water in the canner (NOT the boiling water I put in the jars). This prevents hard water stains on the outside of the jars. Pat, your post leaves me with a question….are you saying that older beans (7+ years) can be cooked and will become soft if cooked in a pressure “cooker” or are you saying old bean will only cook soft if pressure “canned” and then cooked? I had many pounds of pinto beans stored away for Y2K. I tried to cook them in a pot and i cooked and cooked them and i couldn’t get them soft. I looked on line and they said to use a pressure cooker and I did, and they got soft. A pressure cooker is the only way I cook beans now, fresh or old. 3 quarts water, 3 cups of beans, 3 slices of hog jowl and 40 minutes of the giggler. Perfection. There is another way. If you soak your beans in salt water before cooking them, they will be soft as a baby’s bottom, but still retaining their shape. 3 tablespoons salt dissolved in one gallon of cold water, soak for 8 to 24 hours (I’ve soaked for longer times, too), drain and cook as usual. Recipe said 2 cups of beans, but that’s enough water for double (or more) that amount of beans. Gives improved texture and creaminess. I always soak my chickpeas this way, otherwise they are never soft and creamy. You will want to lower or even eliminate salt when cooking the beans. Adding vinegar is a good trick, thanks for mentioning it. Can’t wait to try some of the new ideas posted here for canning dried beans. I love having soaked beans on hand for skillet recipes! One thing I recently learned is that you are no longer required to warm lids before using them. You just wash them in warm water and they are ready to go! This sparks another question: because I have ‘wanted’ to try canning for a long time, but have really yet to…..I have some lids etc that now are several years old and yet never used. Would these lids still be good and safe to use? Is there a test? Does it matter how, where they have been stored~~temperature wise, etc.? This article and the comments have really piqued my interest in seriously giving canning a go~~~yea!!! I would say they are safe to use. I’ve used lids that I’ve had in storage that were 3-4 years old and they still work. well, i did have some handed down to me that did NOT seal. seems like ball changes packaging every “five?” years. if you call them they can tell you how old your lids are. kind of a pain to go thru all that work and not have them seal. Thanks for useful tips on Canning Beans. Is there certain stores that you recommend for buying beans in bulk? Where I live, I don’t know of a store that carries bulk beans or any home staple. Any help out there? If you have an amish store around you, you can check there…even if they don’t usually sell them in big bags, you can ask if they would. The ones here will. I actually get mine from Azure.com. If they happen to have a drop close enough to you, they are a GREAT place to get organic and/or bulk foods! LOVE them! I found a store online called Webstaurant that will sell bulk beans. I just recently bought 60lb. of dried beans and 20 of Basmati rice much cheaper than I have found it elsewhere. You might try there. Everything is geared toward a restaurant of course but I have purchased other items from them and they ship very fast. Just keep in mind your shipping costs as you will have to figure that in as well. I was ordering others things I wanted so did one big shipment. They may split up your shipment but will not charge you more. Great idea about canning them. I will definitely be doing this. I have never canned beans, but I do freeze them. When I cook some I usually do a 5 pound bag and then freeze them in Ziploc bags to have ready to use when I need them. I find they make my family less gassy then store-bought canned beans. I am interested as to how many of you have frozen dried beans. Do you fully cook them? Do you unthaw prior to use? Are they too soft for chili etc? Thank you Deb for your info on where I may be able to locate bulk foods. No Amish store around that I know of but I will look online and see just how far away. Also will check out the Azure.com that you gave me. Thanks a bunch and God Bless!!! My Integrative Nutrition textbook reccommends cooking beans with kombu (ie. kelp) to help with their digestion and nutritive value. Also, it reccommends adding salt after cooking to avoid interfering with the cooking process. It was also a recipe in that book that led me to start including cumin. Beans, onions, mushrooms, and leafy greens are good together as anti-inflammatory foods for building immunity and fighting cancer and heart disease. Canning presoaked beans will have them ready for making chili or goulash. I am looking forward to it, and thank you for the canning instructions. I did 7 qts of pinto beans with one clove of garlic in each jar in my presto canner this evening. I took them out at 5pm and they are still bubbling at 8pm at rather cool room temperature. Weird. It isn’t all that strange that jars boil for a while after pressure canning. The jars are being heated to 240 degrees or so, so they are hot and are in a pot design to make and keep things hot. If I process foods right before bed and go to sleep before the canner depressurizes the jars are usually still pretty warm when I take them out in the morning. Robbie – You can definitely play with the amount. Some people add more. I found when I did this that coming out of the canner the beans had condensed on the bottom of the jar. I loosened them up (rotating the jar around) and they filled the space as shown in the picture. I hope this helps! So you are saying that I do not need to cook the beans first? Just put dry beans in the jar with water and can? I have been wondering when you can the beans without cooking them do they cook in the pressure canner to the point that you when you open the can the beans are ready to eat or do they require more cooking? They do!!! When you open them up, it’s just like opening a can of store-bought beans only without all the chemicals! Do you really mean that you fill each jar 1/3 full with SOAKED beans and then fill it up leaving headspace with boiling water? It seems to me that the soaked beans are already full grown so filling each jar only 1/3 full would leave a lot of just water. Also if you measure 1/2 cup of dry beans per pint, filling each jar 1/3 full after they have soaked comes out to be a lot more jars than what I had measured for. Can you clarify? I found that I needed to put much more in the jar than indicated here. When I followed instructions, I ended up with about 1/3 jar of beans. I have since put filled the jars about 2/3 full with beans then finished off with water. I had the same issue – was canning both (separately) organic black beans and organic kidney beans. Soaked beans for 12-15 hours, filled pint jar 1/3 with soaked beans and filled to 1″ headspace with water. Made WAY more jars than I had intended and jars were only about 1/3 full of beans after canning. I’m going to soak a scant 1/2 cup of beans tonight and see how full that fills a pint jar for reference for next time. What is wrong with canning beans without soaking? I have done it for years and never had a problem. I rinse them before using just like store canned beans. This is a site about cooking the Traditional Foods way — ie, nutrient-dense, easy to digest food. Soaking beans overnight makes beans easier to digest. Just as on a Traditional Foods site you will only see preparing grains by soaking, souring, or sprouting, you will also only see beans prepared by soaking or sprouting first to improve nutrient density and ability to digest. Gee I thought this was a discussion about canning beans with nutrition. Maybe I didn’t ask my question properly. Why is it nutritionally better to soak before you can? Isn’t a bean that has been pressured for 90 minutes about as digestible as it can get?What is wrong with the water that comes off the beans after soaking and why wouldn’t beans that have been dry canned and rinsed before using be just as nutritious and easy to digest? I am certainly not a dietitian nor an expert on this topic, I am just trying to learn and understand. Janyce — There is a reason behind it. Beans have complex sugars that are hard for us to digest and cause “issues”. An extended, warm soak allows the sugars to pass out of the beans and into the water. Then we discard the water (it’s better for us). This method for canning beans includes that step of soaking and discarding the soaking water because we feel it’s a more nutritious practice, making beans more digestible and better for us. half of my batch I did not soak.. but only put about 1/2 cup of beans in the jar then add hot water and can.. I find they dont get as mushy… because I like to simmer my beans in whatever spices I am using and Like a ham hock or bacon.. when I soaked them they got to mushy for me! It appears, from what I can see, that you aren’t actually cooking the beans before canning them? Only soaking? I was just curious as to how long they take to cook when you’re ready to serve…I love making dried beans but the reason I sometimes opt for canned is simply the cooking time. It takes so long to cook dried beans versus a can if I’m in a hurry. Does soaking drastically shorten the cooking time? Exactly! Only soak them. They cook in the pressure canner. The last time I canned black beans for use in chili, I put my chili seasoning in them before canning. When I opened a jar to put in my chili, it was just like opening a store-bought can of chili beans, only better for you! They could have been eaten right out of the jar and been delish! Only cold! I assume she pressure canned. Meat isn’t safe to eat if water bath method is used. I’ve never canned anything but would love to start since we eat a lot of beans, can you tell me what is a scant? What a coincidence that I stumbled upon this discussion. ….I am canning pinto beans tonight. For one, I also have an All American canner. I have the one that holds 14 quart jars. It saves a huge amount of time & energy! I soak 9.5 # of beans to fill 14 quarts. Also, I start the process either while I’m making, or just after dinner. That way, the processing is done about the time I’m heading for bed. I turn off the burner & go to bed. In the morning, the canner is cooled & ready to be put aside so I can make breakfast. Since I have I large family, I can beans 2 or 3 nights in a row to stock up. Then I’m set for about 6 months! Very convenient! I am so glad to find this article. I quit buying most canned foods, but I couldn’t find frozen tomatoes or beans. I’ve bought dry beans but haven’t cooked them because I live alone and 1lb seems a lot of beans for 1 person. I’m on soc.sec. so I can’t buy one of those expensive canners and I’ll have to save for a cheaper one. I’m excited about canning beans, I’ve been wanting to try canning tomatoes with the water bath canning but haven’t managed to buy one of those yet either. Thank you for the instructions and encouragement. You can use any large pot as a water bath canner. You need to have a rack of some sort in the bottom to keep the jars from contacting the bottom surface and it must be deep enough to cover your filled jars with water while processing. For a makeshift rack, you can use extra screw bands flat side up, just be sure you have enough in the pot to keep your jars from tipping. I learned to can beans when I first started to use my new pressure canner. I wanted to use something less expensive than meat to make mistakes with. As several of you already have said, It is a good activity for fall and winter, when fresh summer produce is put up. I have a small Mirro canner, and two pounds of beans makes about eight pints. It’s just my husband and me now, so this lets me put up a load after dinner. I have a nice selection of beans in my pantry for very little work. The ladies I know who canned all summer don’t have great memories of the experience, but this is a nice hobby. I tried this and was sorely disappointed I think someone took the unsoaked recipe and just copied and pasted it because if you soak 1/2cp per pint jar and then fill the jar 1/3 full with soaked beans you end up with 1/3 of a jar of beans and 2/3 of water and a LOT of left over beans. So don’t do that. Soak 1/2cp of beans and put it in the jar which will fill it around 2/3 full then can it. So handy to have jars of beans to just pour into things, once you do it right.